Harvard Business Review has identified outsourcing as one of the most important management ideas and practices of the past 75 years. Spending by U.S. organizations on outsourced business services will triple from $100 billion to $318 billion. Studies indicate that outsourcing is increasingly viewed positively by executives and top management alike, at both US and multinational companies. One in four organizations plan to increase their outsourcing spending by 25% or more. Outsourcing will represent 19.5% of the typical executive's budget, up from 16.4% today. Firms in dynamic markets such as telecommunications, high-tech products, and professional services, already source more than 40% of their operations outside. Innovation is now seen as the key strategic benefit of outsourcing. According to a study released by PricewaterhouseCoopers, top US companies are turning to business process outsourcing based on interviews with senior executives at more than 100 U.S. companies averaging about $4.4 billion in yearly revenue. About 73 percent of U.S. executives interviewed said their companies presently outsource one or more business processes to external service providers. Outsource2india is a leading external service provider with a dedicated Offshore Development Center (ODC) at Bangalore in India. O2I has kept pace with the changing management trends in outsourcing by building on our domain expertise and investing in our team of expert professionals. At Outsource2india, we believe in taking ownership of our client's outsourced processes so as to optimize efficiencies and create value in their business. Outsource2india has enabled clients to achieve business goals with outsourcing solutions delivered across a spectrum of services such as Call Center Services, Data Entry Services, Engineering Services, Healthcare BPO, Finance and Accounting Services, Software Development, Research and Analysis Services, Photo Editing Services, Creative Design and Web-analytics Services. Contact Outsource2india for your business process outsourcing needs. The study defines business-process outsourcing (BPO) as the long-term contracting of a non-core business processes to an outside service provider. BPO lets companies focus on core competencies to increase efficiency without having to invest in people and technology. It also helps companies become more profitable and leads to better service levels than internal departments can provide. A majority of the polled executives said BPO helps a company maintain a competitive edge. The PricewaterhouseCoopers Global Top Decision-Makers StudySM is a landmark study  the first to focus exclusively on BPO at billion-dollar multinationals. Conducted by Yankelovich Partners for PricewaterhouseCoopers, the study provides an in-depth report of the attitudes and behavior of senior executives and their companies toward BPO in general, and Finance & Accounting Services (F&A Services) specifically. Interviews were conducted with 304 top decision-making executives in 14 countries: CEOs, Presidents, CFOs, COOs and CIOs. Among this group, 192 companies ( 63%) report outsourcing one or more business processes. And, of these companies ( 41% ) report outsourcing Finance & Accounting Services which includes General F&A, Internal Audit, and Tax Compliance. Over 300 companies participated in the study  covering the Americas, Europe, Asia Pacific, and South America. The findings of the study reflect an increasing interest in, and usage of, Business Process Outsourcing as a strategic initiative. Top executives are increasingly recognizing the need to manage their company's growth with less infrastructure. Thus, they are considering outsourcing processes that are essential, but not core to the growth of their business, including Finance & Accounting functions. More than 8 out of 10 executives (84%) outsourcing Finance and Accounting services are satisfied with their initiatives. One third of these executives report that BPO initiatives are in their company's current business plans. In summary, the Yankelovich research suggests that the bottom-line benefits of BPO are beginning to be recognized and appreciated. Forward thinking CEOs and CFOs are increasingly utilizing BPO as a new strategic tool to improve their competitive stance, their profitability and ultimately, helping to build shareholder value. India is uniquely placed to offer a wide range of quality, cost-effective outsourced services, such as IT and IT-enabled services including finance and accounting, human resources and customer care. 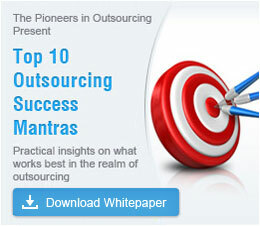 Read about it in Outsourcing Success Stories. If outsourcing is in your business plan, proceed with confidence. Take the step towards outsourcing through Outsource2india. We make it easy for you to find the right outsourcing provider.